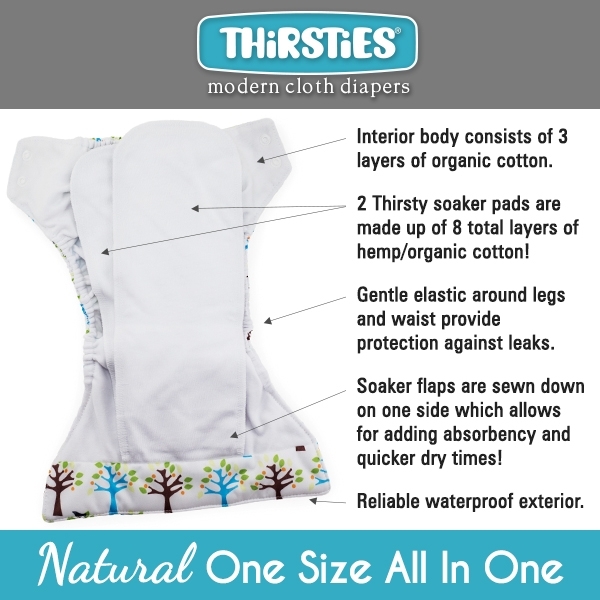 I purchased Thirsties Diapers initially because of the patterns. 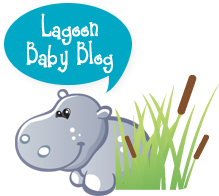 While I love the patterns - I find the natural fibre inserts are a bit finicky and have to make sure they are super flat when you air dry the diaper otherwise they get very crinkly and don't lie flat in the diaper. For my little guy this can cause him to be quite uncomfortable. I'm not sure if this is a boy thing but since there is no stay dry or wicking material in the diaper my LO would always be left wet and red. However when I explained my issue to Natalie she was great and suggested adding a Fleece Liner. Since putting that in the diaper they have worked well. I like this diaper. So far it has worked well. I do find that it takes a long time to dry and the built in inserts are a pain to spray off. I prefer the insert tucked inside like in a Blueberry AIO or completely removable like in a Best Bottom. 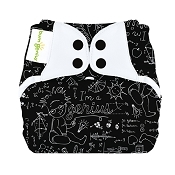 We ordered this diaper to try as I'm in love with all in ones plus I really wanted the cute print! It fits my babe well and stands the test of time. We have gone 3 hours in his diaper and could probably go longer but I like to change my babe often. We also have BG free times, elementals and a blueberry simplex and I would say it most compares to the blue berry for a much better price! Will be adding more to my stash! The NAIO is quite the absorbant diaper! I have tried a few different AIOs, natural and stay dry fibres, and these are fairly trim, flexible, and very absorbant. My 3 month old is already becoming a heavy wetter, and these absorb alot and fast! I have never had any blowouts or leaks in the past few weeks I've been using them. Having two soakers attached on one end allows me to fold the bottom towards the front for my little guy, for more absorbancy where we need it! 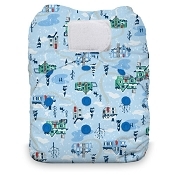 It is so far the most trim AIO that I do not need to add any extra inserts to for longer periods of time. We are able to go 6 or 7 hours overnight without leaks so far. Major bonus - they are offered in some very cute prints! These are my favorite all-in-one! 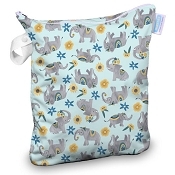 They have great absorbency (better than Blueberry or Smart Bottoms AIOs) and are just so easy to use. Easy to get a good fit, even for hubby or grandparents. No stuffing or finding the right inserts on laundry day. I’ve never had a blow out in these (although I trust the double gussets on Thirsties pockets a little more). Only time I had leaks was when we needed to increase the rise setting. I also usually fold the top soaker in half to create extra absorbency at the front for my boy. Plus I love most of the prints! 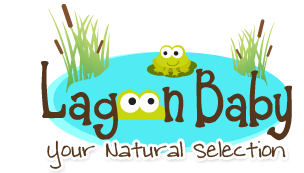 I love that this diaper contains all natural materials, and no fleece lining. It is extremely absorbent, trim, and has held up perfectly with a year of washing and drying. My only issue is that lint gets trapped inside the sewn in inserts, but it is easy to remove. A great investment! 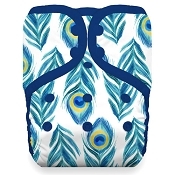 Like the absorbency of these AIOs but they take forever to dry, especially at the seams were the liner parts attach to the rest of the diaper.